A piece of SHE ...: Not Without My Daughter - Story of Betty's fatal escape from Iran with her daughter. Not Without My Daughter - Story of Betty's fatal escape from Iran with her daughter. Few days back, I met my friend. She wanted to buy few Bengali books for her niece. Therefore, we boarded metro train to reach college street aka “Boi Para” in Bengali. College Street is the largest second hand book market in the world. You will find all types of books here at throwaway prices. I had spent almost two and the half years of my student life here. I studied in Calcutta University, which is located in College Street. This place is heaven for those who love reading. Wherever you look, you will find students roaming around streets or people either buying or selling books. This place is all about books and learners. Time magazine listed College Street in their “Best of Asia” list in 2007. Many political activities also take place in College Street. This is the place where new and innovative ideas give birth every day. After my friend was done with buying books for her niece, I started looking something for me. While, I was hoping to get books by Jean Sasson as I still have hangover of Love in a torn land, my friend pointed out at a book to me laid on footpath in the heaps of second hand books. I picked it up reluctantly. 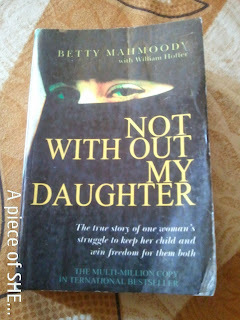 It was “Not without my daughter “by Betty Mahmoody. My eyes instantly brightened up when I found out that, even if it was not from Jean Sasson but this is exactly the kind of book I was looking for to read. I returned from College Street happily as a proud owner of a second hand book, Not Without My Daughter! Betty was born on June 9, 1945 in Michigan. She is famous for her autobiography, Not without My Daughter, which had been later presented as motion picture on screen, in 1991, directed by Brian Gilbert. Betty now works as the co founder of an organization, One World: For Children, which provides safety to the children of, inter –cultural marriages and help them to understand and deal with two different cultures of their parents. I think most of you already know about this book or had seen movie long back. But I haven’t watched the movie and got to know about it only few days back only when I bought this book. In case, you are like me and haven’t read it yet then keep on reading my post to know what’s it’s all about and if you should read it or not. Don’t worry I will not reveal everything here and so wouldn’t spoil your happy reading journey with this book. Betty married Iranian Physician, Sayed Bozorg Mahamoody aka “Moody” after dating each other for many years. They were living like a happy married couple. Betty felt she had the best husband in the world who understands her and her family, shower gifts, flowers on her daily. Betty’s life was perfect. She could not ask anything more from God. Iran and America were living happily under one roof, respecting and at times adopting each other’s culture. Love was the only reason, which made it possible but you cannot rely on love forever. People change and this book will give you a perfect example of that. Betty loved Americanised Iranian Moody who was changing slowly into a strange orthodox nationality. In 1970, Iranian people were not happy with the then ruler of Iran, Mohammad Reza Saha because of his liberal ways and his good relationship with American government. Reza believe in giving some rights to the women which made them angry further. People dismissed his leadership, which led to Iranian Revolution. Ayatollah Khomeini took advantage of this situation and eventually became emperor of Iran. Ayatollah dismissed Iran’s old constitution and imposed new constitution, Islamic Republic of Iran that included many strict rules especially for women. Many educated Iranians who were living outside Iran strangely supported Khomeini and his ways. As soon as he came into power, they started craving to live their life in Iran. Moody was one of them. Things between Betty and Moody started changing since then. Moody got himself involved in politics. His colleague started calling him Dr. Khomeini. Eventually, he lost his job and blamed American staffs for it. He begun loathing Americans and withdrew his application for American citizenship. He had become determined to return to Iran with his wife and daughter especially after his nephew, Mammal visited America for his treatment. Mammal stayed with them and he convinced Moody to return to Iran with his family. Together they shaped a conspiracy to take his wife Betty and daughter Mahtob to Iran forever. Moody somehow convinced Betty that they are going to Iran for two weeks to see his family and then trapped them after reaching there. Not without My Daughter is about how Betty made it back to America alive and safely with her daughter. 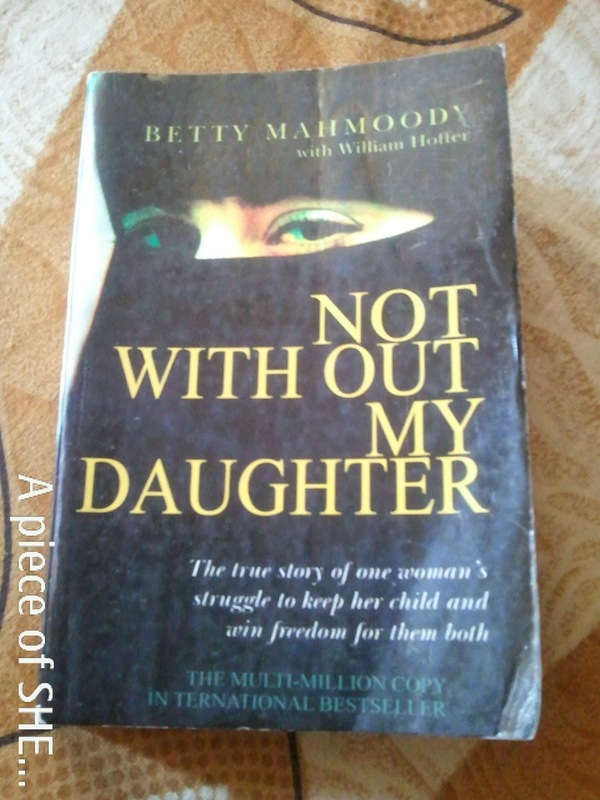 While I was googling “Betty Mahmoody”, I found out that Moody created a documentary called “Without my daughter” to tell his side of story to world. He claimed in this documentary that her wife knew about his decision to stay in Iran before they came. Do I recommend it? : Yes! Your words can make or break a relationship. All addictions are bad even if you are addicted to LOVE. Is this the life you wanted for yourself ? That awkward moment when you fail life's exam before appearing for it. Hi Shainee, Having seen you mentioned on Michelle's Vintage Cobweb I thought I'd stop by and say hello. Nice to meet you, PW. Interesting review Shainee. I guess there are always 2 sides to every story. Hope you are having a good week.